The lawmakers said Whitaker's appointment was unconstitutional because he was never confirmed to serve in a job "requiring the advice and consent of the Senate." WASHINGTON — Three Senate Democrats filed a federal lawsuit on Monday to block Matt Whitaker from serving as the acting U.S. attorney general, claiming that his appointment to the post by President Donald Trump was unconstitutional. In a suit filed in the U.S. District Court for the District of Columbia, Sens. Richard Blumenthal, D-Conn., Mazie Hirono, D-Hawaii, and Sheldon Whitehouse, D-R.I., alleged that Trump's appointment of Whitaker violates the Appointments Clause of the Constitution because Whitaker was never confirmed by the Senate to serve in any position "requiring the advice and consent of the Senate," which includes the job of attorney general. News of the lawsuit, filed against Trump and Whitaker, was first reported by the Daily Beast. "By designating Mr. Whitaker to perform the functions and duties of the Attorney General without having been subject to Senate confirmation, President Trump has unlawfully denied the Plaintiffs their right, as sitting U.S. Senators, to vote on whether to consent to his appointment to that role," the trio of senators, who are all members of the Senate Judiciary Committee, said in the suit. "Defendant Whitaker has not been confirmed to serve as a principal Officer of the United States or to serve in any other position requiring the advice and consent of the Senate," they wrote. "Defendants are therefore violating the Appointments Clause." The senators' complaint asks the court to declare Whitaker’s appointment unconstitutional and to enjoin him from serving as acting attorney general. "Installing Matthew Whitaker so flagrantly defies constitutional law that any viewer of School House Rock would recognize it. Americans prize a system of checks and balances, which President Trump's dictatorial appointment betrays," Blumenthal said in a joint statement from the three senators on Monday. In a statement issued later Monday, Senate Minority Leader Chuck Schumer, D-N.Y., lauded his colleagues for filing the "important" suit, and for "shining a bright light on the president's unconstitutional appointment of Matthew Whitaker as acting attorney general." Whitaker had been serving as chief of staff to Attorney General Jeff Sessions before being appointed as acting attorney general on Nov. 7, after Sessions announced that he was stepping down at thepresident's request. Whitaker was confirmed by the Senate as a U.S. attorney for the Southern District of Iowa — a position he held from 2004 to 2009. But he was not confirmed by the Senate to be Sessions' chief of staff or to be acting attorney general. As acting attorney general, Whitaker now oversees special counsel Robert Mueller's probe into Russian electoral interference and possible ties between Trump's campaign and Moscow. 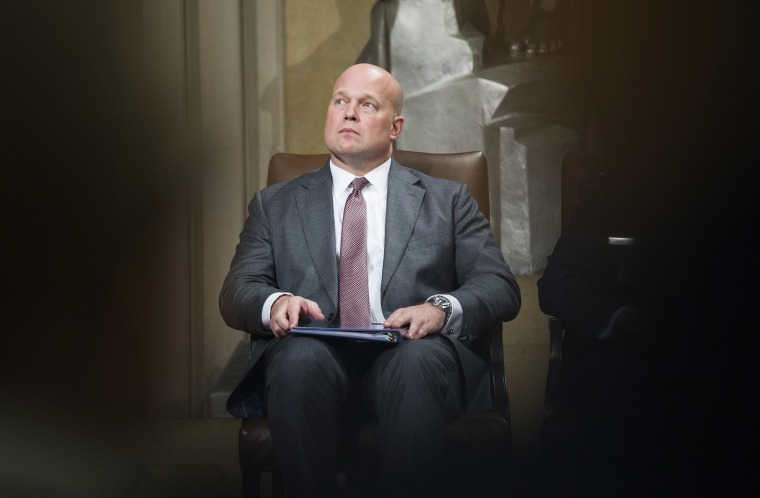 The suit Monday comes just days after opponents of Whitaker's appointment asked the U.S. Supreme Court to rule that he is not legally qualified for the job. Whitaker cannot be in the position, the challengers contended, because he wasn't confirmed by the Senate. Tom Goldstein, the Washington lawyer who filed the challenge to Whitaker's appointment in the Supreme Court Friday, is also behind a similar suit brought last week by the state of Maryland in federal court. The Trump administration has vigorously defended Whitaker's appointment. An opinion from the Justice Department's Office of Legal Counsel said the government has identified over 160 times throughout U.S. history when presidents appointed non-Senate confirmed government officials to serve in high level positions. In recent years, the opinion said, such appointments were made by Presidents George W. Bush and Barack Obama. In appointing Whitaker as acting attorney general, Trump acted under the Federal Vacancies Reform Act, the latest version of a law on the books since 1868. In its current form, it says the president can fill a vacant position at a Cabinet department in one of three ways — designating the deputy to take over, choosing someone nominated by the president and confirmed by the Senate for a different job, or naming someone serving in a senior position in the relevant agency for at least 90 days. Garrett Haake reported from Washington, and Adam Edelman reported from New York.